An approach to estimating the potential effect from strengthening of comparative advantages in manufacturing industries due to intensification of industrial cooperation in the course of shaping the Common Economic Space has been suggested. The approach is based on estimating the interrelation of comparative advantages in final and intermediate commodities of the industry and empirically defining the labor productivity gap between the enterprises with the growing and decreasing staff. Original Russian Text © V.A. Salnikov, A.A. Gnidchenko, D.I. Galimov, 2016. The article was written under the program of fundamental studies of the National Research University—Higher School of Economics in 2015 (TZ–12). In the article, the results obtained in the scientific-research project of the Eurasian Economic Commission are also used. 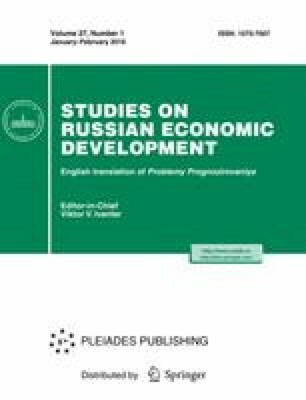 The guidelines of the articles are also represented in the reports at the XV April International Scientific Conference of National Research University—Higher School of Economics (April 3, 2014, Moscow). The authors are grateful to A.N. Mogilat.